2. Remove the battery pack and the bottom cover. 3. Locate the password-override connector on the system board. #6 above. 4. Install a jumper between the two pins at position 1. Remove the jumper from the password-override connector when service is completed. The ThinkPad 720 and 720C systems have a IBM 486SLC2 50/25MHz microprocessor and a math coprocessor socket for an optional Intel 80387SL processor. Optional IC DRAM cards of 2MB, 4MB or 8MB are available. An optional 240MB HDD is also available to contain large operating systems and application requiring a large storage space. TRACKPOINT II: The 720 and 720C has a TrackPoint II built into the keyboard. It works like the mouse and allows the user to point and select icons on the screen under control of the application. It consists of a device that stands between the "G" and "H" keys, accompanied by two "Click-Buttons", which are positioned below the space-bar. The device reacts to pressure from the finger-tip and the left button is used for selecting or dragging items on the screen. The right button simulates the Enter key in some applications. DISPLAY (MONOCHROME): A 9.5-inch diagonal LCD, Supertwisted Neumatic (STN) 640 x 480 pels, Video Graphics Array (VGA) resolution, cold florescent sidelighted display with an 18 to 1 contrast ratio. Depending on the application, up to 64 grey scales can be addressed. It displays black characters on a white background and it may be reversed to a white on black mode by a simple switch operation. DISPLAY (COLOR): A 10.4-inch diagonal color LCD, thin film transistor (TFT) 640 x 480 pels, Video Graphics Array (VGA) resolution, cold fluorescent sidelighted display with a 100 to 1 (minimum) contrast ratio. Depending on the application, 256 colors are available simultaneously out of a palette of 4,096 colors in VGA mode (640 x 480). There are over 921,000 thin film transistors used in its construction, and with advanced manufacturing techniques a defect rate of less than .00002 can be maintained. This quality state of the art VGA screen provides clear, bright, vibrant colors approaching cathode-ray-tube technology. o Rechargeable battery pack for 4 to 8 hours (monochrome) or 2.4 to 4.8 hours (color) of use, depending on operating, environmental and application characteristics. When on AC power, an idle or operating system unit can charge the battery in approximately 1.5 hours (monochrome/color). The system internal quick charge takes approximately 1.4 hours (monochrome/color) during Suspend and power-off with AC adapter connected. o The battery pack is an internal power source to the computer when the AC adapter is not available. The battery pack is rechargeable and is charged using the AC adapter or the ThinkPad Quick Charger, which can charge two battery packs simultaneously. With a fully charged battery pack, the user can operate the computer up to 8 hours (monochrome) or 4.8 hours (color) depending on the application and the configuration usage. PC Cards that do not support the power management function may cause the shorter battery operation hours. (9) Power management and application dependent. NIMH BATTERY PACK WITH POWER STATUS INDICATORS: A rechargeable battery pack with five power status LED indicators and one push button located on the front bezel of a battery pack. These five LEDs show how much the battery power remains when the user is pushing the button. In full-charged state, all five LEDs are lit. One LED means about 20% of battery power. The battery operation hours and charging times are the same as those of the standard NiMH battery pack. battery pack slot to DISCHARGE the battery packs before charging them. There are identifiers and indicators that tell the charging status for each battery pack installed. desk. Removal procedure is simply done by using opening levers. A wire or chain can be used to secure the port replicator on the desk. ° Computer using external power, car battery or AC. o high temperature- system suspend mode until temperature is normal. Compatible with TP 700/C, 720/C, replaces existing cable. Supports 32-bit access in W95 (all others use 'compatibility mode'). Uses any 8-12mm IDE drive >/=540MB; BIOS rounds down to 2GB,1GB or 540MB. Requires new BIOS chip, refdisk ver 1.20. About 2x as fast as original ESDI drives. These interfaces were designed by the Swedish company Onsite in about 1995. There seems to be some interest in these, and there are about 500 unpopulated flex PCB's left, so they may put back into production (the remaining 500 only) at some point. These were used in replacement plug-in drives sold to corporate customers (@$1200+ in 1995!). The strange 'round-down' scenario is a function of the controller chip passing specific hard-coded geometry parameters to the bios. It was easier to modify the bios than re-do the chip as drive sizes increased. They all use the same cyl/sector count, but the head no. is 16, 32 or 64 for the 540MB, 1GB and 2GB sizes respectively. IBM never made any MicroChannel drives (Ed. ESDI?) 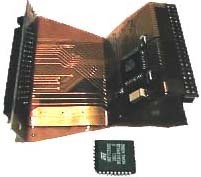 bigger than 160MB, and their 240 and 340 drives used a similar interface translation chip.